Way back then … who could’ve known? The year was 2000 … an absolute eternity ago in this Internet age. Think about how the world of small business has changed since then. How could we have possibly known, way back then, that leads that cost $100 – $200 a piece would cost as little as 20¢, just 15 years later? Or that many small businesses would be too busy working to look up and see the opportunity? 1. They buy Infusionsoft without realizing it is a powerful tool. Unfortunately, that power takes hours and hours and hours of learning and work to fully grasp and implement. Many somehow think that because they bought Infusionsoft, their business will somehow magically grow. And when it doesn’t, they are disappointed. Honestly, I don’t know where the blame lies. I don’t know if it is the sales pitch. Or just magical thinking. But if you don’t implement, it can’t help you … just sayin’. Here is the thing. To have sales … you have to have traffic. If you didn’t have traffic before you bought Infusionsoft, you aren’t going to magically get it after. So how do you get traffic? More specifically, how do you get qualified traffic, into your Infusionsoft funnel, at low cost? Occasionally, you can get by on word of mouth. But not if you really want to grow your business. 15 years ago, when I was first starting my investment firm, a sales rep for one of the local news-talk stations in Dallas – KRLD – approached me about advertising . At the time, the rep, Bob, told me to run a bare bones ad schedule, once a month, would be $1500 – $2000 per month with a six month commitment. That is a big nut for a bootstrapped start-up! Especially for a fledgling investment firm trying to catch hold after the great Internet Bubble had just burst! I gulped very hard, did it … and rode KRLD from $0 to $4 million in revenue. 1. I have often thought about how lucky I got. You see, I tried several other radio stations over the years. None of the others were that successful for me. 2. At our peak, we were spending $20K/month, just with that one radio station. Let’s assume 100,000 people heard my ad each day. How many of those people were my target audience? Tiny. And, of those, how many would actually engage? And how many would we close? The cost per lead was massive! The only reason it worked was because both the immediate and lifetime value of a customer was so high. 3. In spite of what anyone tells you, with mass market advertising, which is all we had back then, there is really no way to test what ads worked and what didn’t … No way to target. No way to test. It was like trying to hit a lit match with a firehose … blindfolded. Thanks to Google and Facebook, it is now exceedingly easy for a small business to reach out to the exact people who are interested in what we are selling. How refreshing! Because we can now target so precisely, we can do it for a very low up front investment … literally a few dollars a day … and at a cost of $1 – $5 per lead. Now that’s what I’m talking about! When you combine the power of Facebook advertising with Infusionsoft, you can drive those costs down even further … because you can use the data in Infusionsoft to ratchet your targeted audiences down to a pin head … literally just a handful of people, if you want. Now you can show them extremely relevant ads (or not) based on exactly where they are in your funnel. And … oh yeah! You now have cheap, qualified traffic coming into the top of your funnel …so you can grow, without betting the farm! So we run Facebook ads to people who have never been to our site but are interested in Infusionsoft. This is what is called cold traffic. But even still, compared to what I used to do, it already pretty targeted … and pretty cheap. Actually, we know who has, because you are tagged in Infusionsoft as soon as you do. So we create a Facebook custom audience of people who registered for the webinar that Sync2CRM keeps automatically updated in Facebook. We will use PlusThis to tag who attended the webinar and who didn’t. So those who attended but haven’t bought yet will see one ad, while those who didn’t attend and haven’t bought yet will get another ad. And let’s not forget those who didn’t register at all. They expressed interest by visiting the page, but maybe they didn’t have time … Or who knows why that didn’t register. So they will get yet a third ad that speaks specifically to them. You can see how this works, when done right … With each layer of precision, the cost per lead goes down, down, down. And conversion rates go up, up, up. Now, in case you are wondering, none of this replaces the other marketing you are doing. You are still sending emails, for example. This just compliments it. 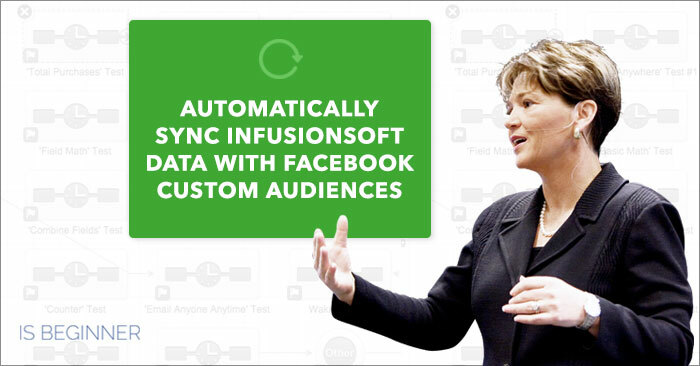 Use your Infusionsoft custom audience, in combination with website custom audiences and other targeting criteria to define highly targeted audiences for your ads. If you are new to Facebook advertising, it can be a little bit intimidating. I felt the same way for a long time. But honestly, it isn’t that hard. Especially with so many places to learn from. As always, I am happy to answer any questions you have … either here or on my Facebook page. If you found this post useful, hit the Like and Share buttons. That way I know what to create more of and what didn’t land. Challenge Question: If you are doing Facebook advertising already, can you share with others your best advice? And if you aren’t doing Facebook ads yet, what is the biggest barrier to getting started? Please share here or on Facebook.